The Openreach Fibre First roll-out now stretches to 25 towns, cities or boroughs with the addition of 11 new locations. The latest areas to be announced are Bury, Barking & Dagenham, Bexley, Croydon, Greater Glasgow region, Harrow, Merton, Redbridge, Richmond upon Thames, Sutton Coldfield, and Salford. The roll-out pace of around 13,000 premises per week is not enough to hit the three million premises passed target by the end of 2020 so an additional 3,000 new trainees will be hired during 2019 across the UK to support the roll-out of full fibre. Openreach is ambitious for the UK and is determined to build full fibre as quickly as possible to ensure the country has a reliable broadband network capable of supporting future data-hungry services and applications essential for boosting productivity and sustaining our position as a leading digital economy. In the last year, we’ve learnt to build at high quality, and at a competitive cost. This year, we’ll prove that we can build the network on a vast scale and connect customers seamlessly. We’re making great progress towards reaching our target of upgrading three million homes and businesses to full fibre by the end of 2020 – reaching another 13k premises per week – and these new recruits will play a crucial role in that programme. 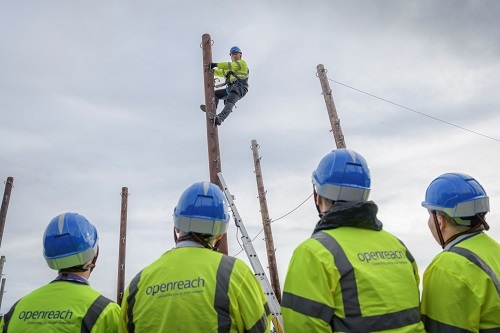 Openreach is a people business and our new apprentices will enable us to fulfil our commitments, with an ultimate ambition to deliver the best possible connectivity to everyone, everywhere, equally, across the entire country. We’re committed to being the UK’s national provider, so on top of our recruitment plans announced today, we’ve made public the next 11 locations where we’ll start building over the next 12 months. We’ll also be publishing updated plans every three months to give people a clear idea of where we’re building. For those interested in applying for a trainee position at Openreach details of scheme can be found at www.openreach.co.uk/careers and the distribution around the UK is 226 roles in Scotland, 346 in the North East, 277 in the North West, 280 in North Wales and the West Midlands, 419 in East Anglia, 306 in South Wales and the South Midlands, 334 in the South East, 428 across London, 389 in the South Cental area and finally 262 in the South West. Information on which actual areas have actually got FTTP via the Fibre First programme has been spartan with our own broadband maps probably being the first sighting for many people and Openreach is now planning to provide more information on its website with quarterly updates on which exchanges where FTTP is live, being built or planned. You would think that full fibre being rolled out is very obvious, but in urban areas with sufficient ducting and pavement chambers the fact that fibre has been deployed and the final connection manifold is simply waiting for someone to order the service is not really visible compared to overhead deployment areas. Almost all the Fibre First areas have some FTTP already due to things like new build premises, but in terms of roll-out that looks more like Fibre First we have seen full fibre arriving in Belfast, Birmingham, Bristol, Cardiff and Liverpool where it overlaps with existing VDSL2 coverage plus parts of Westminster and Holborn areas in London. Our tracking of the pace of the roll-out flucuates as while Openreach may be building at a relatively steady rate some areas seem to go live en-masse rather than street by street, a similar situation has been observed with the G.fast roll-outs and we presume this is down to things like the local street works are done but services are waiting on work at the handover exchange to add more hardware/capacity. The declared roll-out pace of 13,000 per week is actually lower than the 21,000 per week we have been finding in the last three weeks and the pace needed to reach the three million figure is around the rate we are currently finding FTTP that is live (looking at a longer period in the last two months we have added 96,000 premises of Openreach FTTP to our coverage database). We will continue our steady stream of news on FTTP and G.fast additions as well as the monthly round-ups and of course welcome input from our visitors on any areas we have missed. Is there any indication on what the "Greater Glasgow area" actually means. It is really rather vague. @jabuzzard I believe that it relates to Bearsden as its the only section I can find related to Glasgow on the checker. It would be nice if North Lanarkshire is included in the Greater Glasgow as I stay in Wishaw. However my gut feeling is that it will be limited to areas within Glasgow City center. While the roll-out rate of 13000 per week is too low for Openreach to hit their target, it compares favourably with other companies. For example the total number of people connected by Gigaclear to date would take Openreach less than two weeks (I know the territories are different, but it puts the rate of altnet roll-outs into perspective). On the roll-out rate, see the final paragraph, i.e. signs that the pace is increasing or it might be that we missed a lot in the previous months and are catching up. In other words need to see how things behave over a much longer period of time. In other news, residents on North Skye remain contented with an 8Mbps ADSLMax service, knowing that despite £1m+ State Aid to provide the BT-HIE Seg1.15 cable from Dunvegan to Carnan (South Uist), there's only 300Mbps of back haul capacity from Dunvegan Exchange, with one-off ECC costs of £22,000.